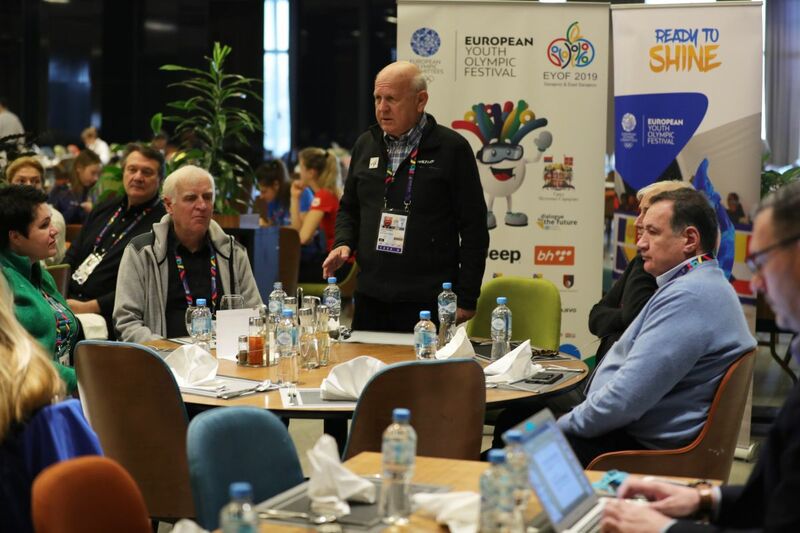 A media breakfast with European Olympic Committees (EOC) President Janez Kocijančič and members of the EOC Executive Committee was held today in Sarajevo ahead of the Opening Ceremony for the 2019 European Youth Olympic Festival (EYOF) Sarajevo & East Sarajevo. Media representatives from across Europe attended the event, providing them with an opportunity to pose questions to the EOC leadership in an informal setting. The EOC President added that the 2019 sports calendar will be a busy one in Europe, with the winter and summer editions of the EYOF, the Games of the Small States of Europe and the European Games all taking place this year. Also attending the breakfast were EOC Vice President Niels Nygaard, EOC Secretary General Raffaele Pagnozzi, and EOC Member Spyros Capralos and Daina Gudzinevičiūtė. Held under the patronage of the IOC, and the pride of the European Olympic Committees with almost 30 years of tradition, the EYOF is the first top European multi-sport event aimed at young athletes aged 14 to 18. There is a winter and a summer edition, which take place in two-year cycles, in odd-numbered years. The event takes place under the Olympic flag and is rich with Olympic traditions: from the lighting of the flame to athletes’ and officials’ oaths. It is at the EYOF that many of Europe’s inspiring sports stars of tomorrow take their first steps on the international stage. And while some may enjoy EYOF as a stepping-stone to Olympic greatness, all who participate take home friendships and experiences to last a lifetime. In total, 46 European National Olympic Committees will participate in Sarajevo & East Sarajevo, with athletes competing in eight sports: alpine skiing, biathlon, cross-country skiing, figure skating, ice hockey, short track speed skating, snowboarding and curling.